This is correspondence to and from newspaper editor and publisher Frederick W. Brinkerhoff. The bulk of letters date from the 1940s and 1950s, His first newspaper job was with the Ottawa Herald, after which he worked for the Fort Scott Republican, Chanute Sun, Chanute Tribune, Kansas City Star, Pittsburg Headlight, and the Pittsburg Sun. Brinkerhoff was also vice-president and a director of Stauffer Publications as well as director of Capper Publications Inc., the Topeka State Journal Company, and Newton Publishing Company. In addition, he was vice-president of the KSEK Broadcasting Company in Pittsburg. Brinkerhoff was well known as a journalist, serving as president of the Kansas Press Association in 1935 and as chairman of the Kansas Associated Press in 1946-1947. He also served as a member of the Pulitzer Prize jury for editorial writing in 1950 and 1951. In 1956, he received the William Allen White award to a Kansas editor for journalistic merit. Active in community affairs, Brinkerhoff was a member of the board of the Pittsburg Public Library, served as chairman of the Pittsburg Industrial Commission, and was on the board of directors and served a term as president of the Pittsburg Chamber of Commerce. He was also active in Republican party politics. Brinkerhoff was interested in the history of the state and served as president of the Kansas State Historical Society in 1944. The correspondence is arranged chronologically and grouped alphabetically by individuals with whom Brinkerhoff was in frequent contact, including Roy F. Bailey, Arthur Capper, Rolla Clymer, Harry W. Colmery, Harry Darby, Jess C. Denious, Myron George, Merl Huffman, Clyde M. Reed, Richard W. Robbins, Andrew Schoeppel, and Oscar Stauffer, among many others. 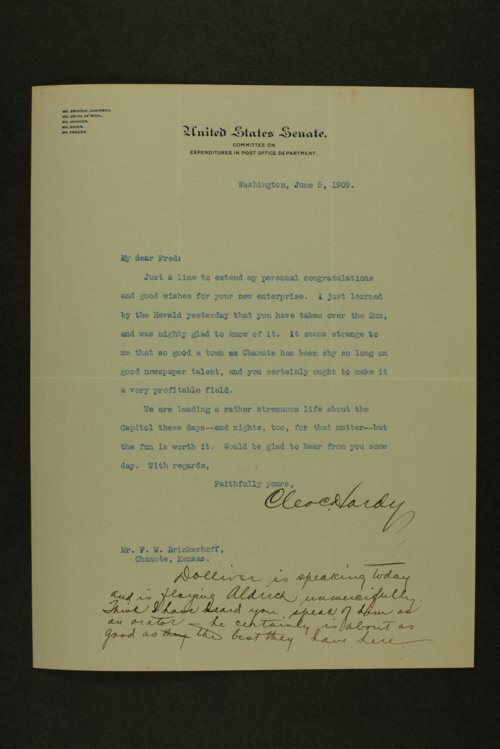 Collections - Manuscript - Brinkerhoff, Frederick W.